Is the Gold/blk Vroof 67 in front of your car a known car? something to do with the chosen color scheme. I assume the original 302 was long gone, but what other original components did you get with the car? The original drivetrain went into the yellow '68 that replaced this car on the track. I know the VIN of that car but have so far been unable to track it down. Wow Jon, that is just beautiful, a real credit to you! And what a hugely significant car. I believe it was one of only 3 or 4 Camaros entered in the first Trans-Am race of the 1967 season? Thanks, Steve. Much appreciated. It was one of four Camaros at the first race of the '67 season. The others were driven by Mark Donohue, Craig Fisher, and Joie Chitwood. Jon, what is the race history of this car? I see Johnny Moore ran selected Trans-Am rounds following Daytona and Sebring in 1967, and then he also entered Daytona and Sebring again in 1968 in a Camaro. Were the 1968 events in this car? that is some good info I hope you are able to locate that other car and the motor. How many of the 4 survived? My car ran the Daytona 300 Trans-Am, Sebring 4-Hr Trans-Am, won the Cumberland SCCA A-Sedan event, ran the Mid-Ohio Trans-Am, the Paul Revere 250, the Bryar 250 Trans-Am, the Marlboro 300 Trans-Am and, as its finale, it ran in the '68 Daytona 24-hr. 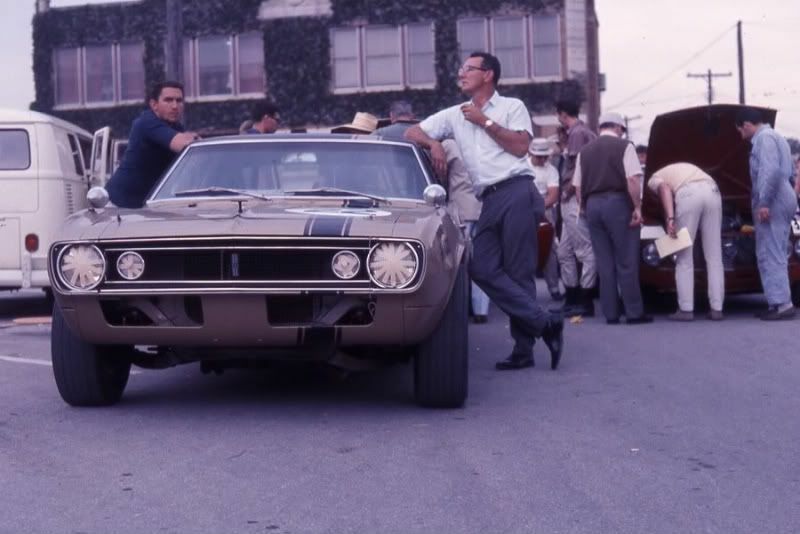 It was put back to a street car after that and the yellow '68 that the team purchased replaced my car on the track. My car and the Craig Fisher car still exist. The Donohue car went to Europe and the trail goes cold after about 1970. No idea whether it survives or not. The Chitwood car may still survive. I still have some homework to do on that one. Congrats Jon! Doing a fine job with the car and history. Question I noticed your in your vintage pics your car has the spoiler and the gold hurst car did not. When did this option become available? if it was beneficial it seems like both cars would have run it right?